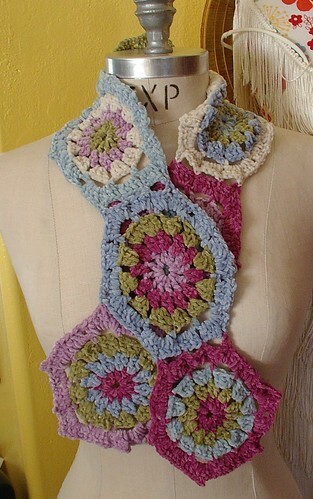 I started a hex blanket in chenille in 2007. Never got around to finishing it as the more I worked with it the more I figured it would not hold up well as a blanket. So I removed a few hexes from it and gave the frogged ones to my kids to play with the yarn. What was left was this scarf. So I thought I would post a picture of it. I like it!! Looks like velvet almost. Merry Christmas!